Two women, a fashion editor nearing her mid-thirties and a model who's just twenty, go to Gothenburg for a photo shoot. Suzanne calls her lover, desperate to see him. Doris, the model, is stopped on the street by an elegant older man who offers to buy her the gown she is eyeing in a boutique window. Later that day, each women meets up with her man, and seduction seems imminent until each is interrupted by another woman, in one case, a wife, in another, a daughter. Desire and self-respect, aging and failure play out in both encounters. Suzanne and Doris look for lessons learned, and an unlikely friendship evolves. 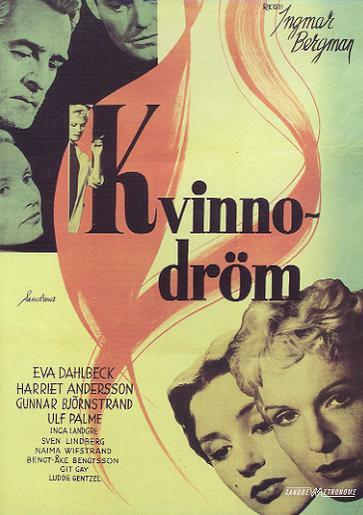 Overlooked Bergman Film A delightful film about the love of two women-the owner of a model agency and her top model. On a photographic outing to another city, both have strange day affairs with married men. The film, as relentless as it is tender, is a deeply probing study into the psyche of desire. Bergman's success is derived from exquisite scenes of austere romanticism and painful irony. Rarely has sexual obsession been so accurately observed. Dreams is yet another masterpiece by Bergman, yet sadly underrated and unknown. For anyone who appreciates great storytelling, and masterful filmmaking should do themselves a favor and watch "Dreams". Note: Look for Bergman's cameo as the man with the poodle at the hotel.